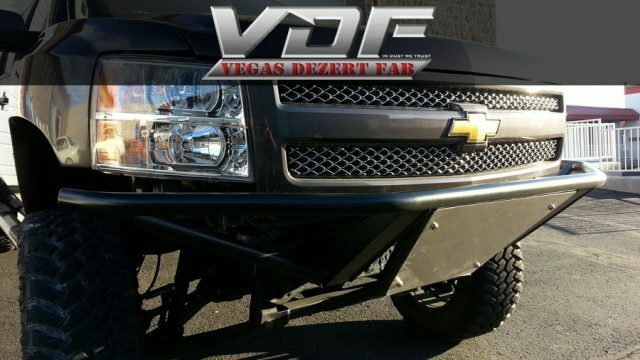 We just fabricated a new prerunner bumper and added Fiberwerx fiberglass fenders on this 2010 Chevy Silverado. After a woman hit our client he decided to ditch the factory bumper for a prerunner bumper. There was also damage to the passenger side headlight and fender so we replaced the headlight and added a set of Fiberwerx fiberglass fenders. Then we had Worldwide Autobody paint match the fenders after we had them fitted on the truck. So if your truck gets hit forget the factory bumper, have us build you a prerunner bumper like we did for this client, contact us today. Tags: bumper, fiberglass, prerunner bumper, prerunner fiberglass, and Silverado.